Island Automotion Ltd. is on the web at www.sucarburetors.com. 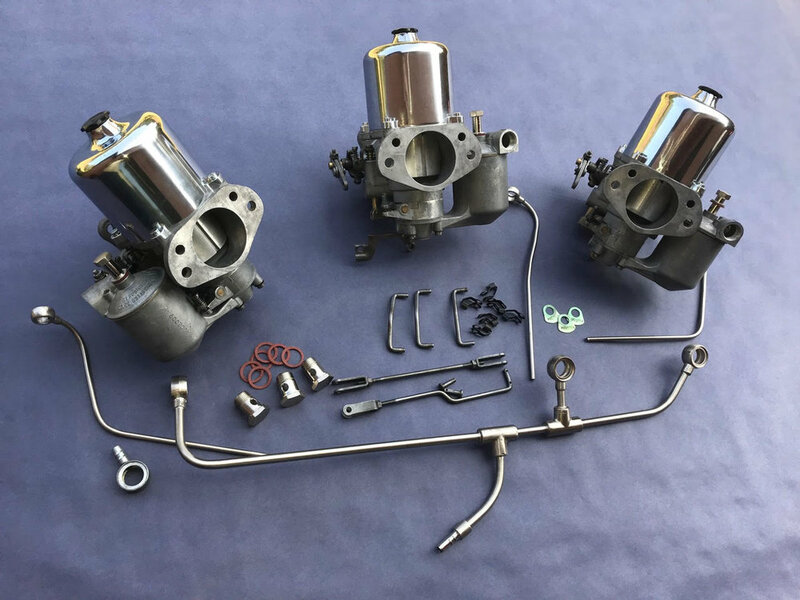 From Alvis to Volvo, Triumph to Jaguar, Rolls-Royce, Bentley, and Healey, Island Automotion has complete and extensive experience with SU carburetors. Stock rebuilds, custom rebuilds, and specialty applications can all be entrusted to Island Automotion. Experience here is not derived just from just carburetor work, but from forty years of working on nearly every aspect of vintage cars. Now I rebuild carburetors, returning them to the condition they were in when the cars were new. Achieving that is done through proper and complete mechanical restoration, and at Island Automotion that means using only SU original equipment replacement parts, and skillful and accurate machining. Your engine doesn’t care what the carburetor looks like – only that it meters fuel and air correctly. Appearance, although important, is secondary. The engine must run properly. So if you require professional rebuilding of SU or Stromberg carburetors, you’ve come to the right place. You have my word on that. Price - Sorry, this set is now sold. However a very rare triple 3.8 complete set may soon be available. This is an original set of Series I 4.2 carburetors complete with linkage, manifold, and air filter adapter. It is not a modern new replacement set nor is it a Mark 10 set modified for manual choke. It is an original set, AUD 227 F/C/R from a 4.2 E-type, and retains the green anodized tags from that era. All parts used in the rebuild are SU factory items. The carburetors have been overhauled, and new style Teflon/steel bushings installed in the bodies to replace the old wrapped Teflon and circlip style. This permits the installation of modern fuel proof throttle shaft seals. New float valves and main jets, also of the latest design, have been installed, along with UM needles – if you have a preference for a different profile they can be installed instead at no extra charge. The fuel rail and overflow pipes are satin nickel plated, as are the large linkage components. The fuel rail uses a hose barb, instead of the troublesome “swivel”. This is the same barb used on the banjo fitting on the fuel filter assembly, which permits easy removal and assembly. Urethane 5/16 clear fuel hose is provided to make the fuel filter to fuel manifold connection. Three new 1/8 inch thick carb to manifold gaskets are provided, along with three air filter adapter to carb gaskets, and new nuts and washers. The intake manifold has been cleaned, and satin polished on its upper surface. All linkage from the carbs to the firewall is provided. The return spring anchors, and springs are not included. The air filter adapter has been powder coated to a very high standard. The carbs are adjusted to run the engine well “out of the box” and preliminary adjustments have also been made to the lost motion levers. Tuning instructions are included, and help is always available by email or phone. The carbs are warrantied for one year. We can now offer all parts for, and rebuilding of, Zenith Stromberg CD carburetors. All components for these carbs are now available, from the original manufacturer. If you are looking for those hard to find needle height adjusting tools, we can supply those too. Call or write for more information on your particular application. custom fuel needle selection for modified engines — simply tell us your modifications, and we will suggest and supply the appropriate fuel needle(s). 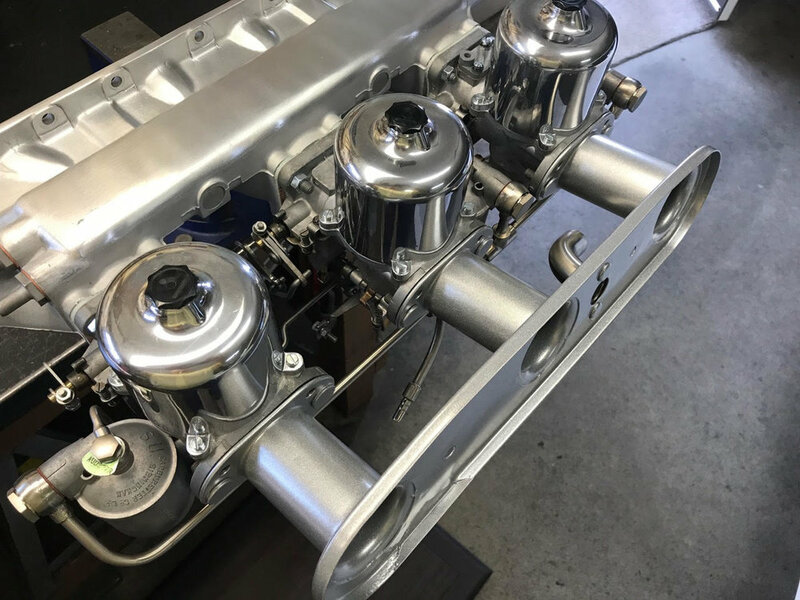 Here is a triple set of Rover HD8 carbs on a Jaguar 3.8 E-type manifold. As received the set was in very poor condition and the linkage was not working smoothly. Most troubling was the fuel manifold, made hastily to serve the three Rover carbs whose fuel inlets are arranged differently. I re-configured the linkage, rebuilt the carbs, and proposed fabricating a new fuel manifold. Consequently I made a custom fuel rail, and had it and other parts satin nickel plated, which is the process Jaguar used. Similarly a few weeks later I received a twin HD8 set that was poorly installed on the Series II Stromberg manifold. The carbs were rebuilt, the linkage re-designed, and another fuel pipe was fabricated and plated. If you have a “hybrid” set of carburetors and want them to work as though they were installed at the factory, Island Automotion can help.